Freshly brewed tea. Earl Grey, loose leaf. Rain on the windowsills. The smell of library books. Escape into worlds greater than this. A quiet life. Maybe boring, but boring was never dangerous. Until I saw what I was missing out on. Who I was missing out on. The man who shattered my boring, safe life and lay it to ruin. The man I’d been in love with since I was a teenager. Who I’d been invisible to since I was a teenager. 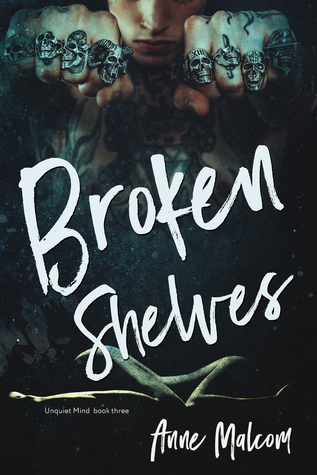 Broken Shelves is the third book in the Unquiet Mind Series and what a book it was. Gina was my girl, I could relate to her so much. Getting lost in books it my JAM! Gina has done everything she could to maintain her life and fade into the background as much as she can. She’s doesn’t want to be seen and wants to live her life cocooned within her safe haven of her home. She wants to go to work to teach her kids and that’s it. Until her best friend’s wedding where she meets the man she’s been in love with since she was in school. Not only that but he’s a rock star, wanted by every female in the world. Sam gets her into bed and they have an unforgettable night. The next morning he dismisses her and breaks her heart. This was such a fantastic read that I was hooked on from the very beginning. Malcom shows the Struggles that comes with the spotlight, the constant judgement and criticism that comes along with it. This book was totally a 6 star read for me and I would highly recommend reading it.